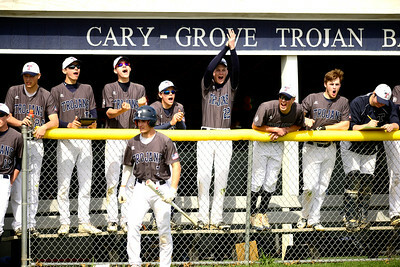 Kayla Wolf for Shaw Media- The Cary-Grove baseball team cheers as a teammate gets walked to first base Saturday April 22, 2017, during a game against Dundee Crown. The Dundee Crown Chargers won 12 to 3. Kayla Wolf for Shaw Media- Cary Grove senior Thomas Neilson pitches Saturday April 22, 2017, during a home game against Dundee Crown.The Dundee Crown Chargers won 12 to 3. Kayla Wolf for Shaw Media- Cary-Grove senior Zach Willis kneels in disbelief Saturday April 22, 2017, as the first base umpire called a teammate out, leading to the third and final out of the inning. The Dundee Crown Chargers won 12 to 3. Kayla Wolf for Shaw Media- Cary-Grove senior Kevin Pedersen is in a pickle Saturday April 22, 2017, as Dundee Crown's Jack Waldron throws the ball to Erik Hedmark. Hedmark finished the play by tagging out Pedersen. 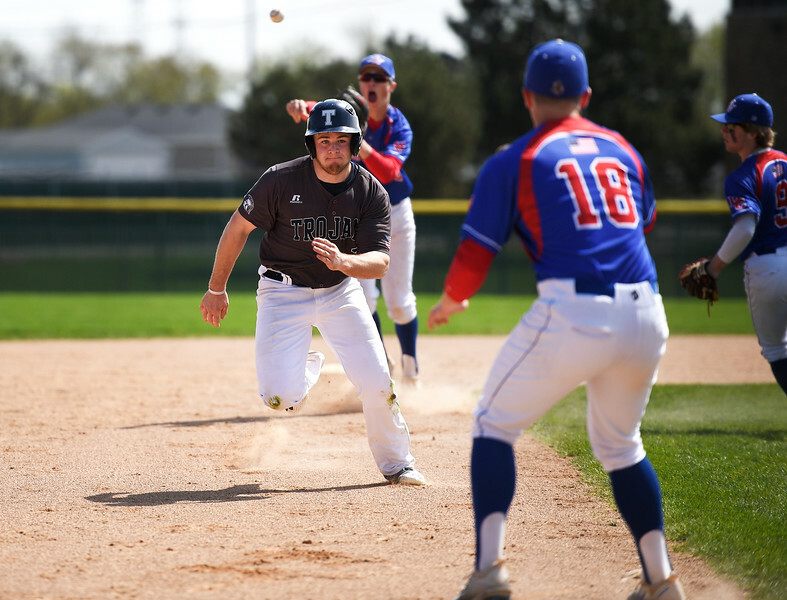 Kayla Wolf for Shaw Media- Dundee Crown senior Jack Waldron tags out Cary-Grove's Tristan Atkins Saturday April 22, 2017, as he attempts to steal second base. Dundee Crown won 12 to 3. Kayla Wolf for Shaw Media- Dundee Crown's Conor Ryan (left) congradulates Jonathan Mays (right) for hitting a deep ball to left field Saturday April 22, 2017, during a game at Cary-Grove. Dundee Crown won 12 to 3. 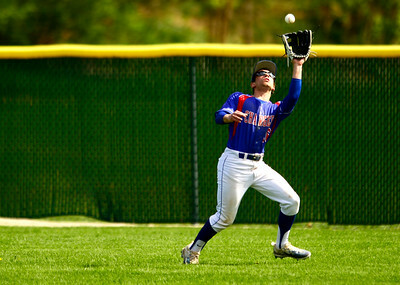 Kayla Wolf for Shaw Media- Dundee Crown senior Scott Wojcik catches a fly ball Saturday April 22, 2017, during a game at Cary-Grove High School. Dundee Crown won 12 to 3. 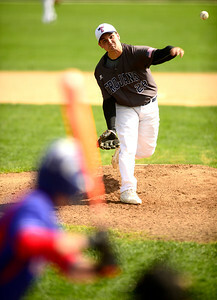 Kayla Wolf for Shaw Media- Dundee Crown junior Erik Hedmark pitches during a game against Cary-Grove Saturday April 22, 2017, at Cary-Grove High School. 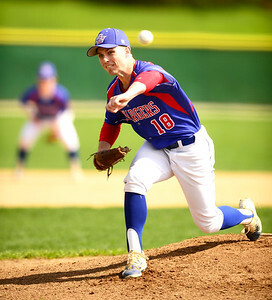 Dundee Crown won 12 to 3 and Hedmark pitched 6 innings.